There’s something to be said for healthy study snacks. Sure, we all get in that mood for the refreshing taste of an apple, the bite of a granola bar, the creamy cup of yogurt. 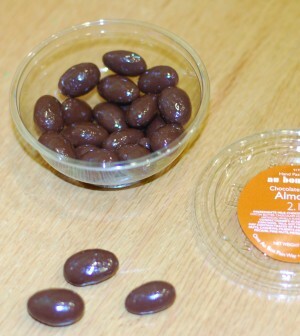 But let’s be real here for a second: chocolate covered almonds from our beloved Au Bon Pain? A whole lot better. There’s the crunch factor, right? There’s the satisfaction of popping one in your mouth and hearing, feeling and tasting it all at once. The chocolate is smooth and sweet, the almond itself round and crisp: a beautifully dynamic duo. They’re what I call a flexible snack – they partner well with endless yummy drinks. I take mine with an iced caramel macchiato, but one could easily pair them with hot chocolate, tea or any other cafe refreshment for an equally enjoyable experience. Another reason to obsess over these little things – as if taste weren’t enough – is the perfect package they come in. It’s a little plastic container with maybe 20 almonds total – an excellent serving for that paper you’re writing or that episode of Grey’s Anatomy you’re watching on Netflix. It’s enough for one task and no more, which is great; make servings any bigger and I’d down far too many for my own good. So next time you’re not really feeling that apple or granola bar or yogurt cup, swing by Au Bon Pain. Let those chocolate covered almonds into your life. Besides the slight inconvenience of acquiring a new obsession, you’ll be glad you tried them out. Take my *crunch* word for it *crunch*.